More and more consumers these days now rely on social media accounts for making almost all purchases for example 47% of millennials are influenced in their purchases by social media. Whether it’s the newest makeup trend, clothing, technology, or even household items, consumers now research on social media for reviews and feedback before making a final decision. I’ll admit that even I use the power of social media to analyze whether I’ll buy product A or product B! It definitely helps even more when there’s an actual video or post from an account with a large number of relevant followers. Accounts with a huge number of real followers will give an audience that trust factor, especially from their favorite online personalities. But let’s start from the very beginning… what exactly is influencer marketing? Although it’s still considered fairly new, it’s definitely used widely from big to small businesses. By creating a strong brand presence utilizing the influencer’s trusted fan-base, it amplifies your message and product even more. If you are selling makeup products and would like to get more exposure and reach, you can research on some popular social media influencers who fit your target. By honing in on a good list of influencers, you can send out sample boxes for them to record or post about their unboxing experience with your products. Once they create a positive review on their own accounts, you should see an upwards trend in traffic to your website, and increase in sales. 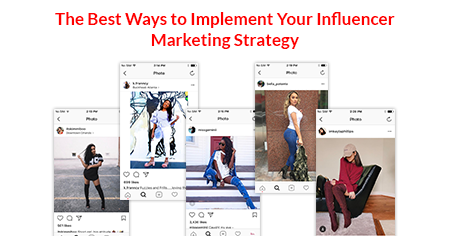 Influencer marketing is known to be one of the more powerful marketing tools you can take advantage of today. It might sound easy to pick and choose a few influencers that you can identify with, but researching on a good list can be difficult. You want to make sure that the product you are promoting gets in the hands of someone that can relate to your product, or has a wide range of fans who would be interested in that product. You wouldn’t send a teeth whitening product to someone who purely reviews the latest technology, or push out fast-fashion shoes to an account that is mainly for reviewing PlayStation games. Although it is very powerful, it also requires an immense amount of research to get the maximum growth and reach. To entice the audience even more, you can also give them an incentive to buy. Usually with products, you can encourage them with a coupon code, BOGO deal, or free shipping! There are a lot of ways to take advantage of social media influencers. You just need to know your product, know your audience, and the best media outlet to get the maximum exposure. 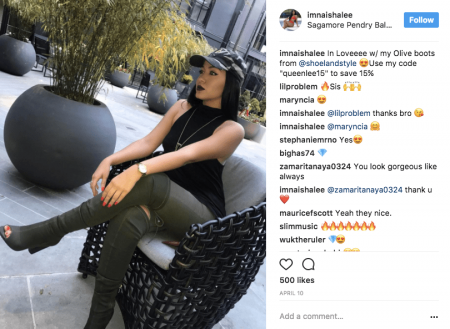 For one of our shoe brand clients, we reached out to imnaishalee. She made a post and listed the coupon code for fans to use. We tracked this campaign so we can measure the effectiveness of our campaigns. The coupon code was used more than 50 times! We also make sure we track and make annotations on Google Analytics to see which influencers make the biggest impact on our website traffic. You can see the annotations and the spikes from the influencer posts below. If you’re interested in getting an influencer marketing campaign set up for your brand, contact us or give us a call at 626.400.4511 so we can help you amplify your brand awareness!